Vasudeva Ghosh used his music and song to preach in Bengal. 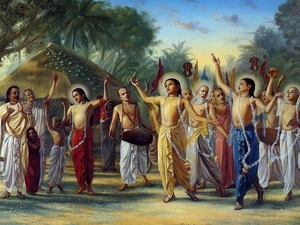 He wrote many Bengali songs about Lord Gauranga which are still sung by devotees. "In Your former lila as Lord Ramacandra, You became famous for constructing a floating bridge of stones across the sea to Sri Lanka. Now in this Kali yuga, You have given us the bridge of Hari Nama sankirtana by which even the lame and blind can cross the sea of birth and death and attain the supreme spiritual happiness." He is Gunatunga-sakhi in Radha Madhava's nitya nikunja vraja lila. His samadhi is in the 64 Samadhis Area.